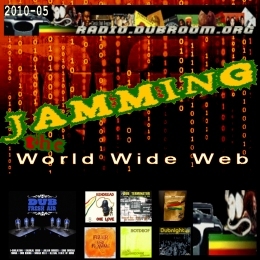 WWW, June 2010 - Jamming The World Wide Web: this is a selection of some of the best material available for free and legal download on a wide variety of websites. From Dancehall to UK DUB, from Old Skool Roots to Contemporary Roots, with vocals and versions, this is by far the most varied podcast thus far. The show starts off with two dubs, the first one taken from the brand new release DUB FRESH AIR by the Italian based Net Label 4WEED. The second one is taken from the DEMO’S AND REMIXES IN DUB. Net Labels are everywhere, including Brazil where we find a nice collection of Dancehall Dubplates with well known Jamaican Vocalists by producer Mykal Orthodox on the Cabeza Label. We play a tune with Burru Banton and one with Bounty Killer. From the Spanish based NEBLINA SOUND we play a jungle version of their Operator riddim, followed by somemore Spanish vibes with Flamenco Dub by Utterance, taken from the DUBNIGHT compilation available on the German based BIGVIBEZ.com website. From that same website, we play two tunes by the German based Reggae band Firetime, a well known Riddim Section who played with too many vocalists to mention. ALAMBIC CONSPIRACY AND FAIZA with their excellent ME SEE YA taken off the ITALIAN DUB COMMUNITY SHOWCASE VOLUME TWO are taking us further into a next section of the show. They’re followed by KEN DREAD’s excellent track ONE LOVE (same title, different tune than the BMW track) and “Midnight DUB” from PARVEZ aka House Of Riddim, the last one taken from DUBNIGHT VOLUME ONE. The show reserves almost twenty minutes for two more thgan exxellent vocals and their dubs by the Spanish based HOTDROP band. Taken from their brand new “DIS(COVER) SHOWCASE” album for which they only used stricktly old skool hardware to produce, two crucial renderings of soulfull old skool Roots Rockers Reggae. In closure, we pay a short visit to the French based DUB CULTURE website where you can find a fine selection of contemporary Roots and DUB by a number of known, lesser known and unknown artists. Radio Dubroom plays Earl 16’s “Give Me Good Sensi”, a Zion Train production and an upfull, majestic Dub by Malone Rootikal.